Apparently, any box with a hole and with strings over it will act as an Aeolian harp. So, if you have the right location and pull out a guitar or violin or standing bass and put it in a slip stream of wind, it will sing. Telephone poles also sing. That's how I discovered the concept years ago. There was a gent online who showed how to make a speaker so you could "listen" to telephone poles, then he wanted you to record them and send the recordings to him to put on the Web. Unfortunately, I lost his email address and no fracturing of English has aided me in Googling him. I tried everything I could. No luck. So, I tried Aeolian harps since that is what was happening. The telephone wires "sing" and the pole connects them to the earth. The pole acts like the neck of a guitar or banjo, and if you put a sound box to it (his was a string to a cup and diaphragm, kind of like an eardrum), you can hear the sound. The number of telephone wires, their relative sizes, and composition, plus the space betwixt the poles all vary the sound quality/quantity and note/tonal range, along with wind speed, and humidity. The gent online had a website that had as its subject "singing telephone poles." If anyone has info on that, please post a comment here so I can look it up, since I've lost all the files I had found on the subject. As kids, we achieved the same effect by stretching a strand of flat rubber from a model airplane (or knicker elastic if you had a sister) between the handlebars of our bikes. Put a twist in it and it vibrated when we rode. This was in the days when a piece of cardboard clicking in the spokes or a folded cigarette packet rubbing against the tyre (tire) was considered great fun. Too simple for today's kids I suspect. I was on a two-week biking holiday round France, and was on my way back to England from Nice, on my own. After a day's ride, I intended to spend the night in a Paris hotel, but there were no vacancies, even at the airport. It was getting late so I decided to get a good meal, fill-up the bike, and ride through the night to the nearest channel port, Dieppe. The route was simple, a dead-straight "D" road, probably Roman. It was a still, warm, moonless night with a heavy overcast so that away from the towns, it was seriously dark. In the 70's, there were no all-night petrol stations in rural France. Late at night there was virtually no traffic. I knew I had to make one tankful last all the way to the coast, so I was riding on a constant throttle at about 45 mph. This was going to be a long boring ride, I thought. Everything had been going to plan but by 2:30 a.m. it was starting to get chilly. I stopped at the side of the road to put on my over-suit and thicker gloves. It was so dark that I could see nothing beyond the pool of light from the bike's single Cibie headlamp. I was nearly ready to start the bike when I heard a strange sound, unlike anything I had heard before. It was like a crowd, all whispering quietly. I could not work out where the sound was coming from. I took my helmet off, and still couldn't. It seemed to becoming from all around me and quite close. Gradually the sound changed. It got a little louder and now sounded like a choir, with each singer making one constant note. There was no recognisable tune or words. I was getting quite unnerved. Miles from anywhere, it could not be a prank. I could still not see anything or localise the source. The sound morphed again. It now sounded like an orchestra tuning up. No tune or rhythm, just lots of instruments playing notes randomly. I could hear brass and strings. Several miles ahead I could see a steady diffuse glow from just beyond the horizon. Just then, the orchestra sound faded and the noise resolved itself into something which at last made some sense. I could hear the distant sound of tyres on tarmac, fading in and out with echoes but that's what it was. As confirmation, a pair of headlights finally crested a distant rise in the road. In the next minute or so, the sound got steadier and I could hear a big truck engine, flat out. Time for a little chuckle to myself, but why did I hear all that weird stuff, and from so far off? Eventually, the truck arrived with a great whoosh, sped past and was gone. In the light of its headlights, all became clear. The road was lined with old fashioned telegraph poles carrying lots of individual wires on porcelain insulators. I had not noticed before because I was halfway between poles. The wires were running directly over my head! 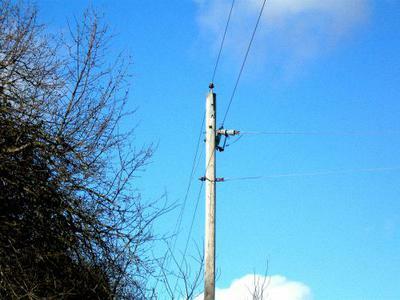 The wires must have picked up the noise of the truck and the runs of wire between the poles acted like violin strings, filtering the sound as it was transmitted along the lines. I know you can hear a train coming a long way through the track. Well, it works with wires too! Find the D915 on Google Maps; It still has the poles but the wires are now bundled, of course. Hi I am from NYC, to me a D is a bad grade or a train line, so then pray tell what is a Roman "D" road? Loved your story btw, it was great and eerie and must have been awesome to hear. But, I am still looking for the name of the site where the gentleman asks for people to build what are essentially transducers to hear telephone poles and upload the sound. Thanks for great story. I enjoyed it. "A" Autoroute - These are like interstate, motorway or autobahn. "N" or "RN" Route National - They were main routes before divided highways. Think route 66. "D" for "Department" - Lesser main roads, these are the responsibility of the local government Department (an area like a county). Two-lane blacktop. Always interesting. In Europe, when people first travelled, they followed the path of least resistance and over time these tracks became the first roads. OK if you want to stroll to the next village, but no good if you have to suppress a rebellion at the other end of the country, and don't want to be ambushed on the way. As the Romans conquered most of Europe around the time of Christ, they built excellent roads. And because they had plenty of money and could use the local population to shift dirt and build bridges, they built them straight! Most are still in use, now topped with modern tarmac. In Italy, you can find bits with the original cobbled surface. Like the Appian Way in Rome. In Europe, if you find yourself on a small road and it is dead straight for more than about five miles, it probably has Roman origins. I loved your description of the experience. Please do let me know, if you ever find the gentleman's site who recorded telephone pole "music". I wish had downloaded it when I found it. I have not heard the recording you are after, but I know how to make one. What you need is a "Throat Microphone." When I was a kid, there was a local government surplus store that used to sell throat mikes. These had been used in WW2 in tanks so that the crew could talk to each other in the heat of battle. They consisted of two leather-faced pickups made up into an elasticated necklace so they were held either side of your throat when in use. They were insensitive to sound in air but would pick up conducted sound perfectly. They worked like moving iron headphones in reverse but with a very thick diaphragm. The nearest I can find now is on ebay. They would be perfect for listening to trees and poles. I am sure you could find something locally. Chris, I discovered an Aeolian information site that's not easy to find in search results, because of its older website style, but it contains a treasure trove of information for Aeolian fans. The site features instructions for recording wind sounds, including the making of a simple yet effective tin can resonator. There's also a link to a university site with instructions for making a contact microphone using a low-cost piezo disc; it would perform similar to the throat mikes that Brian kindly suggested. I've added links to the Aeolian site at the bottom of the Aeolian Harp page so everyone can find them and benefit. Hopefully, this is what you've been wanting. Join in and write your own page! It's easy to do. How? Simply click here to return to Aeolian Harp.